In a deep pot, heat the oil. Add the onion, garlic, green peppers, potatoes, carrots, bay leaves and oregano. Saute for 5 minutes. Add the entire chicken, turning it to brown on all sides. Pour the beer into the pot; it should almost cover the chicken. Mix well, and cover the pot. Reduce the heat to medium low. Intermittently stir and add more beer, if needed, to keep the chicken bathed. Add salt and cook until well-done, about 45 minutes. 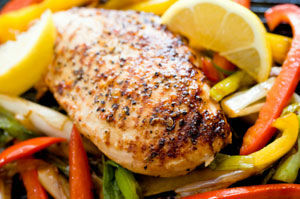 Serve with the vegetables, with the broth poured over the chicken.